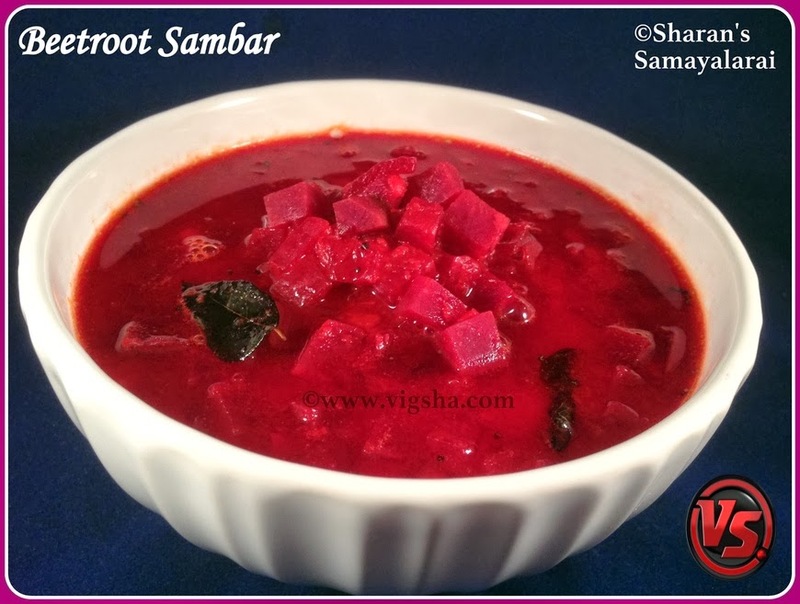 Beetroot Sambar is a combination of flavors which makes it tasty. A colorful and flavorful sambar from South-Indian cuisine. Beets cooked in a tangy-lentils and flavored with Indian spices(sambar powder). Normally, I add other veggies in sambar, but not the beetroot. I wanna give it a try as it is one of my fav veggie. This delectable sambar goes well with steamed rice and Idli varieties. 1). In a pressure cooker, cook toordal with turmeric powder and ¼tsp castor oil. Once cooked, mash it with laddle and keep it aside.Extract the juice from tamarind. 2). Pressure cook beetroot along with the onions, tamarind water, salt, sambar powder, chilli powder for 1-2 whistles until it becomes soft and tender. 3). Once the pressure released, add the cooked toordal to the beetroots and switch on the stove. Check for salt and spices and bring the sambar to a boil. 4). By the time, it begins to boil, prepare the seasoning. Heat oil in a pan, add in the mustard seeds, curry leaves and let it splutter. Then add asafoetida and switch off !When the sambar begins to boil add the seasoning and switch off ! Mix everything together. Serve the Beetroot sambar with steamed rice, Stirfry and Pickle. Enjoy ! # The color of the sambar is so radiant coz of the Beets. It imparts a beautiful red colour to the sambar. # Sambar mainly depends on the asafoetida flavour, so be generous adding it.